One of the first things that comes to your mind when you look at Google Analytics reports is the information you should be focused on, and how this data can help you to improve your business. From the moment your account is set up, Google Analytics starts to capture and display a lot of data. Therefore, your daily routine should be focus on the most important key performance indicators (KPIs), and you should track them on a regular basis. The metrics on your standard reports could make you understand who your visitors are, where they are coming from, the devices they are using, eventually, you will get an idea if you are reaching the target market you wanted or not. Will these standard reports help you to understand if your visitors are doing what you want them to do? Are they completing your important goals? 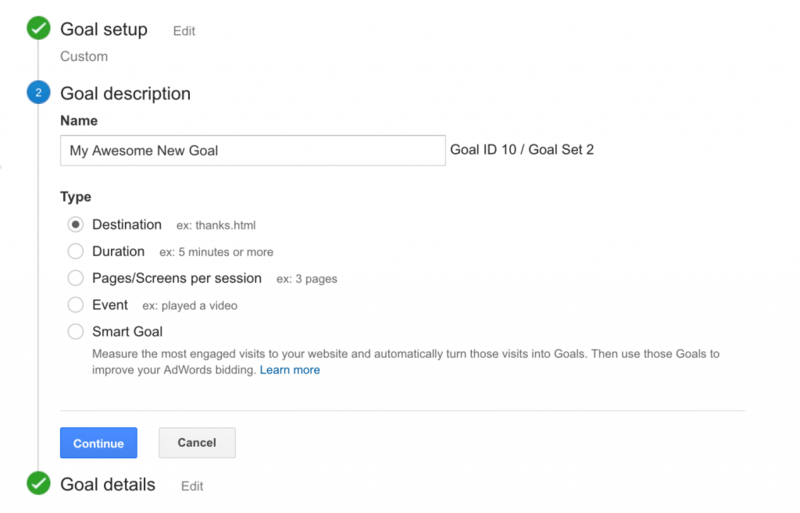 Why Do Google Analytics Goals Matter? No matter if your goal is to sell books online or just to add your visitors to newsletter subscribers. In both cases, you must up goals in Google Analytics so you can see if visitors are taking the actions that you want them to complete. That’s a good question, because Google Analytics goals are not only a method that shows you the final transaction (=macro conversion), but also shows you the micro conversions your visitors did on their path toward this transaction. It is essential to measure these micro conversions, because generally more than 90% of your users aren’t going to complete the final goal you want them to do. If you would ask 100 users why they are visiting your website, you could see that some of them are still in the research/discovery process, some of them are you competitors, some of them are past-buyers and only few of them are visiting in order to complete a purchase. So if you would track only the final action you will miss the biggest part of the picture – and that’s exactly why you should have goals in Google Analytics. Fortunately, Google Analytics helps you to set up different conversion goals. From a user creating his account, to someone signing up for your email newsletter or adding an item to your shopping cart – you can define them as goals in Google Analytics. Once you finish reading this post, you will easily outline specific goals you want users to achieve on your site. You will use this new dimension to understand better your customer’s behaviour when they visit your website. As I wrote before, even if your site is driven by eCommerce you can still use Goals to see how users are interacting with with your buying process, and measure how many micro conversions you have beside the eCommerce transactions. So no matter what kind of website you have – in any case setting goals in Google Analytics is a good choice! 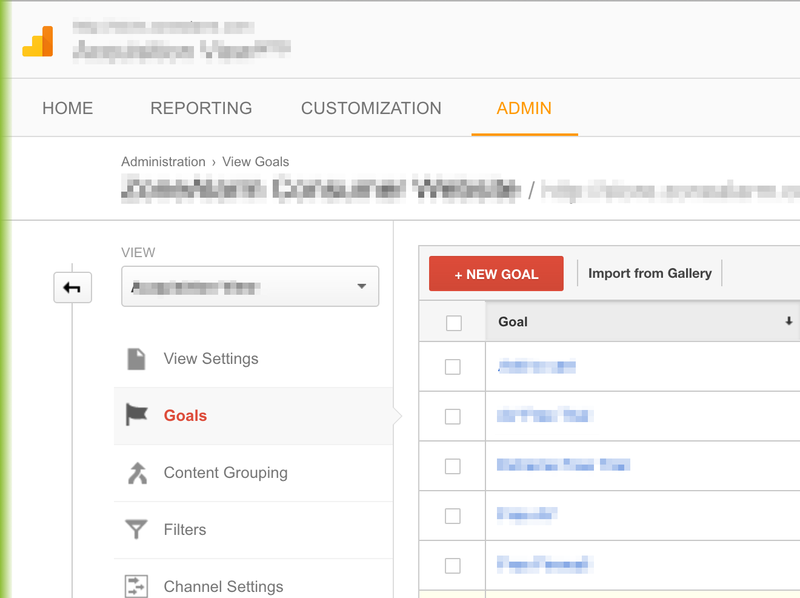 So… How To Create Goals In Google Analytics? First of all, login to your Google Analytics account and select the Admin menu at the top. 1. Select Template under Goal Setup. 2. Click Next step to continue setting up your goal. Templates help you to simplify actions, by setting goals based on a predefined business objectives which are divided into 4 categories: Revenue, Acquisition, Inquiry, Engagement. You can use template as an organization tool to get ideas about the goals you would like to create. If you try to create at least one goal for each category, you will get a better understanding of how users interact with your content. They won’t affect any data, neither your reports. Don’t see any templates? Maybe you didn’t select a specific industry (automotive, entertainment, etc.) within your property settings. If you didn’t select an industry you won’t see templates under your goal settings. You can choose among four different types of goals, let’s see their characteristics together! Destination goals are useful to treat a pageview or screen view (in apps) as a conversion. Enter the name of your thank you page (or app screen) in the Destination field. Specify the match type as Equals to, Begins with, or Regular expression. Remember that if you choose “Equals to” you must enter the exact URI that displays in your reports, without any parameters or other characters. Enter a page name or an app screen name, as you did in the Destination field. Could goals help you to measure the User Engagement? Yes, they do! If you want to measure the user engagement, you can set a goal of session duration or visited pages per session. The Hours, Minutes and Seconds fields specify the minimum time that the user has to spend on the page to generate a goal conversion: if a user spends more than this amount of time on the page, this will count it as a goal in your reports. Another way to evaluate user engagement is to track the interactions of your users with Google Analytics events, and then define this events as goals by using the Event Conditions. For example you can send an event every time when a user clicks the Add to Cart button, likes/comments/shares a post, adds something to wish list, or does any other action that you want to track as a micro conversion. 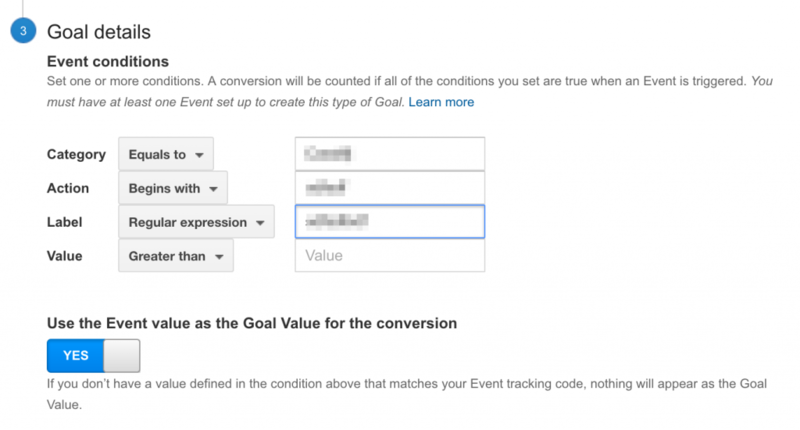 After sending the event you can enter the Event Category and/or Event Action and/or Event Label and/or Event Value in your goal details, and then Google Analytics will count a conversion every time when this event will be fired. If you want your goals to be measured automatically, you have also the possibility to select the option Smart Goals (if available for your account) by selecting Smart Goals under Goal Setup (the 1st step), and then Google Analytics will “use machine learning to examine dozens of signals about your website visits to determine which of those are most likely to result in a conversion” (https://support.google.com/analytics/answer/6153083?hl=en). At this point you may wonder: “how can I give a monetary value for those non-eCommerce goals?”. Well, the answer is: by assigning a goal value to your goals. 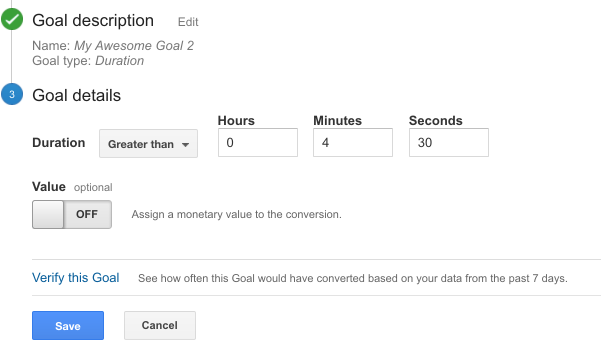 Goal value is a very exciting feature in Google Analytics but people aren’t using it so often, and although I can write a separate article about this topic, I will just give you a short explanation about how can you use it to improve your knowledge for setting up a goal value if you are not sure how much your goals are worth. Well, Let’s say you receive 200 leads a month which produced 20,000$ in revenue, you will need to divide the revenue by the number of leads. The result (100$) is your goal value. • Use the Event value as the goal value: Depending on your setup, this might not be a monetary amount, but you can choose whatever is defined in your Event tracking code as the value. If you haven’t defined an Event value, the goal value will be empty. 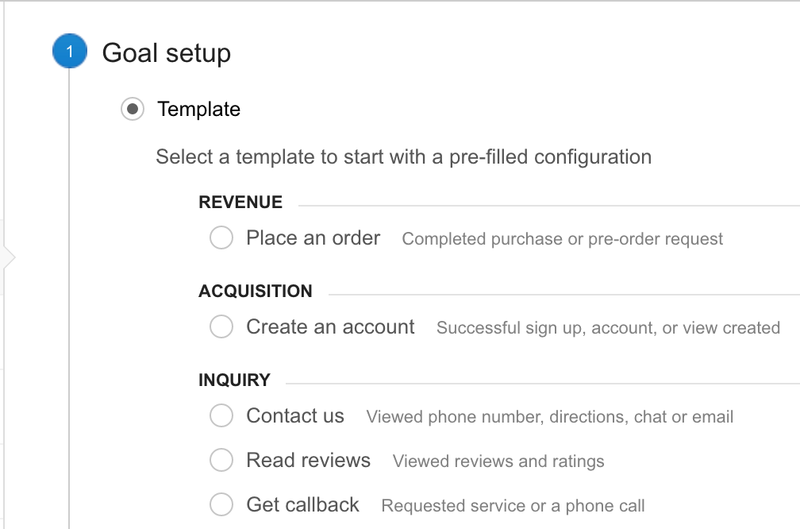 Change the goal value option to YES in the setup for this configuration. • Use a goal value: Keep the goal value option to NO in the setup for this configuration, and manually set the value. Keep in mind that, If you’re already using the eCommerce Tracking code, leave the Goal Value blank. Indeed, the actual value of the transaction will come directly from the eCommerce Tracking code in your shopping cart. To be precise, it will appear in the Revenue metric (not the Goal Value metric). Then, you can change the currency unit for the goal Value in your view settings. If you have an eCommerce site, don’t try to use goals values to track revenue, because goal values are not a substitute for eCommerce tracking in Google Analytics. Use eCommerce Tracking first, if you can. Your eCommerce reports give you much better insights on your products, transactions, and your customers’ timing to purchase. Don’t forget you have Goals cannot be deleted once you have created them and they are limited to 20 goals per View. Well, goals are a great opportunity that Google Analytics gives you: they track your most important KPIs, and let you know exactly how your are reaching your business goals. Seriously, these information, especially if you are using the goal value feature, is a goldmine. You can practically mint money with this data. Make a website more profitable is really a game, if you respect these few simple steps. And even if you already have eCommerce tracking set up – use goals and goal values to better understand the monetary value of your micro conversions. Patricia Alonso is Chief Marketing Manger of Conversioner. She combines her expertise in the field of persuasion and usability to create actionable insights for improving online environments. Patricia is passionate about understanding what really drives human decision making. She currently drives an incredibly talented team to provide clients from all over the world with emotional data-driven solutions.